The latest whiny press release from the Kennel Club has got my back up. It's full of emotive claptrap and half-truths - the sort of rubbish we expect from Animal Aid and their fluffy-minded chums. Dog behaviourists and trainers denounce them; scientific research shows that they can cause severe interference and pain; and new research shows that dogs trained using confrontational methods will continue to be aggressive – so why are electric training devices still legal? Er, SOME behaviourists and trainers denounce them. Some swear by them. Scientific research shows they CAN cause blah blah IF misused. The new research is irrelevant; properly used these aids are NOT confrontational. And why are they still legal? Because they are an invaluable training aid in specific circumstances, and have quite literally saved many dogs' lives (including two very happy spaniels of my acquaintance, who are certainly not traumatised by fear and pain, as these mithering nitwits would have you believe). And is there any evidence of their misuse? I've not seen it. So are we dealing with a real problem here, or just a hypothetical one? To the average joe public, the idea of giving a dog an electric shock just SOUNDS so horrid. For the KC, it's the path of least resistance. But that's the same thinking that goes 'it's cruel to shoot ickle foxes - it must be banned'. Just for fun, see how many propaganda techniques you can spot being used in that press release. If we're going to ban things because they can be misused in dog training, where shall we start? Sticks, leads, rolled-up newspaper... you name it, some moron can misuse it to hurt a dog. The answer is not to ban them all - the moron will still hurt his dog, and ordinary, responsible dog owners will have valuable aids denied to them. If the Kennel Club is going to claim to speak for dog owners, it should make sure it represents their views fairly, rather than presenting a one-sided case. We shooters don't make enough of our traditions and heritage. Let's face it, we're the direct descendants of the aboriginal British hunter-gatherers, and we're continuing a great tradition of nurturing and harvesting Britain's wildlife. We are living history - there should be a preservation order on us! The French have a splendid Museum of Hunting (in the broad sense of the word) - you can read about it in next month's issue of Sporting Shooter (all good newsagents, from 5 March or thereabouts). What do we Brits have? Not a lot. So, first off, I'm proposing we get this project off the ground. Hunting/shooting/etc philanthropists are welcome to drop me an email, or just a brown envelope of used 20s. We'll need to track down the perfect location for the museum, get together a fabulous collection of hunting/shooting memorabilia, and employ a top-notch curator to take care of the stuff and present it really well. The alternative? Well it'd be awful if all that history was lost wouldn't it? Meanwhile, to kick things off, how about a list of hunting/shooting-related folk songs to help us reconnect with our roots? Below is a small selection I found via a Google search. Can anyone suggest others that should be on the list? And is anyone still performing these great old songs? If so, send us some mp3s to put on the website - and let's see you performing at the game fairs! Chatting about all this with Richard Shelton, he pointed out that several infantry regiments use hunting tunes as their regimental marches - something else for me to investigate when I get a spare moment! 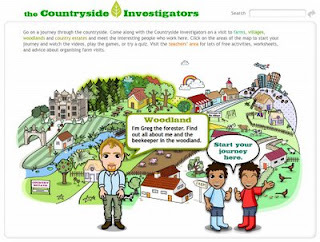 Full marks to Countryside Alliance for their new initiative, Countryside Investigators, an education resource to teach primary schoolchildren about the countryside – complete with pheasants, gamekeeper, farmer etc. 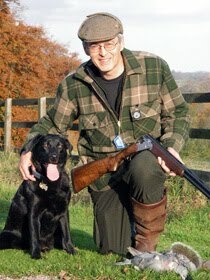 It's good to see pro-shooting organisations countering the vile poison that the antis aim at our kids. This should be hilarious: a bunch of wailing antis pretending to be caught in snares, accompanied by "haunting animal sounds." Apparently this will show the "terrible reality" of snares. Er, no, it will show these people up as a bunch of ill-informed whingers who could and should be spending their time doing something positive for animal welfare. LACS, Advocates for Animals and Animal Aid are still pushing their lies about snares, and irresponsibly campaigning for a ban on a form of pest control that can be highly targeted and humane - even though they know the result will be, like the hunting ban, a backward step for animal welfare. And they're still referring to their discredited "poll" to suggest that there is "overwhelming support" for their campaign. Misguided or disingenuous? You decide. UPDATE: Report of the nonsense here. "Louise Robertson, campaign manager for the League Against Cruel Sports, said: “Snares are indiscriminate killers, any animal can get caught in these." That'll be the same Louise Robertson who was visibly bewildered on Kill It Cook It Eat It - campaigning against something she clearly fails to understand. And by her "indiscriminate killers" argument, those sea eagles have got to go! George at Buckingham Palace after receiving his MBE for services to clay shooting and to charity. Well done George! If you released an equally devastating mammal (mink, for example) in Britain, you'd be a criminal. But somehow a bird is ok. How does that work? And now they want to release them in East Anglia. "It's just part of the balance of nature," said an RSPB spokesman. Not when you go recklessly releasing predators where they haven't existed for years it isn't! Still, the project has gained lots of publicity and I'm sure it's done wonders for RSPB membership, and what's a few owls between friends anyway? 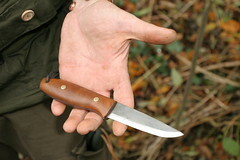 As a magazine for sportsmen who use knives daily for their work and recreation, we are interested to hear that your website has decided to ban the sale of knives, including so far as we can tell, knives that are legal to carry and use. We intend to run a news story on this in our next issue. Could you please confirm that this ban extends to even the smallest Swiss Army style penknife? Also whether or not this ban extends to other outdoors tools such as axes, billhooks, garden forks, etc? We would also welcome your comments on what prompted this ban. Did eBay come under pressure from the Police, Home Office, etc, to implement a ban, or was it entirely at your own instigation? And does eBay seriously believe that this ban will "protect your members" and/or the wider public, or are you simply caving in to a climate of hysteria surrounding knife crime? Full marks to nutty Animal Aid for recycling their rubbish. 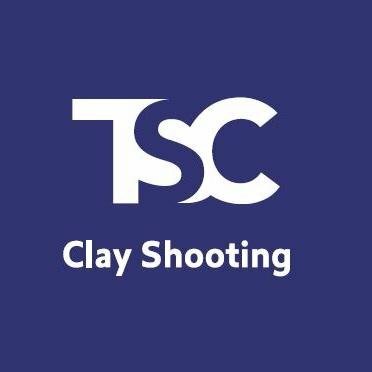 "February 1st marked the end of the pheasant and partridge shooting season, leaving behind it a trail of destruction and death," says their latest press release (only 2 days late then) which urges readers to look at their "undercover footage from the 2008/2009 shoot season" – which turns out to be the same rubbish they posted on 23 December, and most of it was well out of date then. Pathetic! Anywhere other than the south east, people take this sort of thing in their stride. 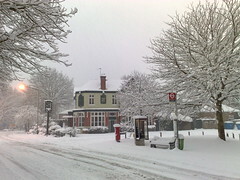 But round here, a few inches of snow and the place grinds to a halt. OK, I could jump in the 4x4 and head off, but the council haven't spread any grit and the roads are littered with numpties in unsuitable cars slipping and sliding all over the place. Still, it's a chance to give some of the more serious kit a proper test. 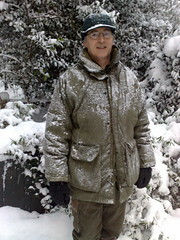 This is the Arktis Falklands coat. It's proving excellent. Good materials, well designed and well put together. The snow sticks to it, but inside it's dry and warm as toast. The big cuffs go well over my ski gloves, and there's a high fleece collar to stop the stuff dripping down my neck. There's a zip-on hood, which I haven't used yet. One minor drawback I've discovered with the coat is that fibres of the filling tend to creep out of the green nylon inner liner, leading to white pilling on the inside of the coat. It doesn't seem to affect performance at all, but when you take the coat off you have little bits of white fluff stuck to the layer beneath. 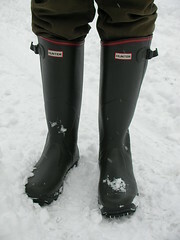 Also trying out the Hunter Bamboo Carbon wellies in the snow - excellent grip from a proper sole, and really good insulation - a world apart from the old basic rubber welly. The soles feel soft and springy, making walking easy. My toes would be frozen in ordinary wellies by now!